The Dollar A Year Billionaire. 1] When he was just a high-school student, he built a program called Synapse, that used an algorithm to learn users’ music-listening habits. Both, Microsoft and AOL tried to buy it, but he just uploaded it for free instead. 3] Mark doesn’t own a television set. 4] At the age of 12, he built an Instant Messaging program for his family to communicate on. 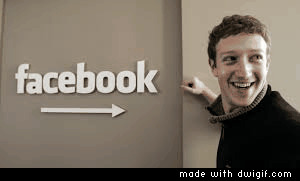 It was called the ZuckNet. 5] Before he made Facebook, he made a website called Facemash, which rated his college peers based on their attractiveness. This, was criticized for objectifying women later. 6] The prodigy started off with a simple C++ for dummies book his parents gifted him when he was a kid. 7] When Facebook was new and gaining popularity fast, he gave out cards that said this. 8] He wears only one grey “Facebook” t-shirt everyday. Yes, everyday. Well, almost. Although he is a billionaire, he’s not too flashy about it. He doesn’t drive flashy sports cars, and doesn’t believe in blowing money on generic billionaire stuff. We’d say that adds on to his coolness, if becoming a billionaire in his 20’s wasn’t enough.